The hissing of Katniss’ name in the tunnels grows stronger, and Peeta seems conditioned to respond to it; Katniss prepares to kill him if need be, but instead he tells her to run. 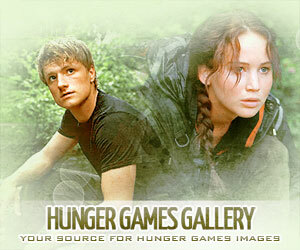 Seeing that Peeta is not dangerous at the moment, she tells the others to split up, but they refuse. They distribute their weapons so that everyone is armed, and they get going. When they’re about three blocks ahead, they hear the screams of Avoxes who were in the way of the mutts. They start smelling the scent of roses, which makes Katniss sick to her stomach. As they get out onto a transfer, Messalla gets caught in an unmarked pod, a beam of light which melts his flesh off his body. They are then found by Peacekeepers and there is a shootout. More Peacekeepers begin to pour out of the sewers, but then Katniss realizes those aren’t Peacekeepers at all, but reptile-like mutts. They run, and Katniss activates a meat grinder pod that chews up the floor tile. Pollux guides them to the main sewer, from which they can go up a ladder to make it aboveground. Jackson and Leeg 1 are missing, having stayed behind at the meat grinder to hold back the mutts. Just as they’re about to go up the ladder, the mutts catch up to them. Katniss is momentarily paralyzed by the smell of roses, but eventually is pushed toward the ladder, which she climbs, followed by Cressida, Peeta and Gale. Katniss tries to go back for the rest but Gale pulls her back, and when she shines a light down the tunnel she sees Finnick being attacked by three mutts. As he’s killed, she sees scenes from Finnick’s life flashing in front of her eyes. She activates the holo and throws it down the tunnel, where it explodes. Pollux locks the sewer cover so any surviving mutts can’t get out. Once they’re safe from the mutts, Katniss notices there’s something wrong with Peeta. He begs them to leave him here, as he’s almost having an attack and can’t control himself, but Katniss won’t have it. She kisses him, tells him to stay with her, and he replies “Always.” They go on to street level, coming out in someone’s utility room. Then a woman comes in, and Katniss shoots her dead. Well, it’s obvious that most of this chapter will probably stay the same. We know a few things, based on trailers so far. The mutts and sewers are in (and terrifying), the Meat Grinder pod has been kept, too (I didn’t even remember this pod until I reread this chapter. I honestly thought it was an invention for the film), and Messalla’s death has also been kept. We also know they would never keep Finnick alive, so that’s a given. Basically, I’m expecting all of this chapter to be kept in. Except for the very final paragraph, in which the survivors enter an apartment still occupied by a shocked Capitol woman, and Katniss shoots her on sight. I desperately hope that they keep it. Katniss is so, so layered. She makes questionable choices, but that’s what makes her such an amazing character to read and watch. And this moment is such a powerful one in the book. I don’t know if they will keep it or not. I can see why they wouldn’t–do they want to portray their hero killing a random civilian? It can be seen as a risk to include it, but as this is the final installment of the series, what do they have to lose? 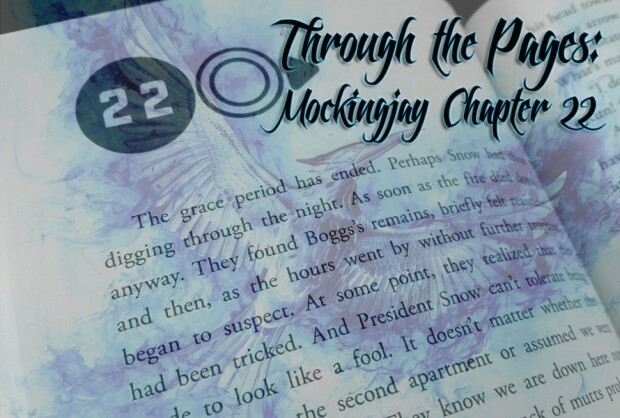 As I said for Through the Pages Chapter 21, I hope there is some cross-cutting between Squad 451 in the underground and the Peacekeepers searching for their bodies and reporting back to Snow. I want to see his bitterness and his command to release the lizard mutts on them. I’d like to see Peeta mutter “Katniss” in unison with the mutts but we’ll have to wait and see if they’ll actually include them hissing her name. I hope that Peeta’s command to keep everyone moving is included too. Now that the proximity of danger is so close, I’d also like to see the anguish and guilt of Katniss, when she comprehends that the people she cares about are sacrificing themselves for her. And hopefully, during the many times she attempts to go back for people, the others shove her forward reinforcing that she shouldn’t waste their lives by throwing herself back in to danger. I have faith that the action of this chapter will be handled with expert care and will be one of the lasting action highlights of the film. We already know from the previous two trailers the majority of Chapter 22’s action is included in the film – terrifying lizard mutts: check; meat grinder in the Transfer and beam of light killing off Messalla: check; Finnick being overwhelmed by mutts: check. If the reference to Pollux having worked in the sewers is included then perhaps we may hear the death of the innocent too. I’m pretty sure the mutts scent of roses will be cut. The sequence of events might be shuffled around a little but the intent and threat, I’m certain, will carry over from the book albeit without being as gory. I doubt the mutts will be covered in blood, it’s unlikely the Peacekeepers will be decapitated and I’m certain when they make it out of the underground they won’t be showered in mutt parts and human entrails after Katniss blows them up. But over the course of the past three films, we have seen that dread can be sensed even if the novel’s more gruesome and violent elements are toned down. No matter how these sequence of events shall be adapted, I know the film will do this chapter justice. The one thing I want verbatim is the moment at the end of the chapter with Katniss and Peeta. This “Stay with me,” “Always,” juncture is one of my favourites in the novels and certainly my favourite shared moment between Katniss and Peeta. We’ve already glimpsed a kiss in the previous trailer and judging by Peeta’s expression, I’m confident that it’s the kiss from this chapter. Logic tells me, that the quickest way from here is to arrive straight to Tigris’ shop. Thereby cutting out the scene in the Capitol apartment but I hope not. I don’t want to pin my hopes on it because of the nature of the deed but I want to see Katniss shoot the civilian. She’s far from an anodyne hero and I want to see this shocking yet chillingly necessary act by her to keep herself and the remaining members of the Squad alive. I love this moment. It says a lot about the true nature of war. Time will tell how brave the filmmakers were and whether it has been included. I said the previous chapter was going to be adapted in broad strokes, but this one is going to definitely be included almost in its entirety. So much stuff happens in this chapter, and we’ve seen most of it already from the final trailer, so it’s a sure bet they’ll be there. I’m already getting chills just thinking about the full scene with the mutts. What I find really interesting is that I don’t think they’ll keep the deaths in the same order. When you watch carefully during that clip of Messalla’s death (we have screencaps of it in our Gallery if you prefer that), you can see that Finnick isn’t there, meaning his death will happen first in the movie. I actually find this to make a lot of sense, because in the book they seem to be going up several levels of tunnels, with several “rooms” in-between (which Katniss calls “Transfers”). Now, this may be the way sewers are actually structured in real life– I wouldn’t know– but I think people who have never been in a sewer (which is most of the audience for this movie, I’m sure) might find that confusing. In the movie they seem to be going up from the sewers, to an underground train station, and then to the street, which I think will make it easier to understand than going sewers > transfer > sewer > platform > street level. 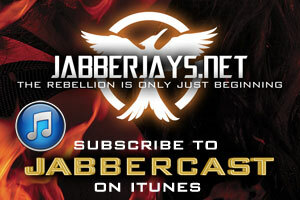 All that means is that Finnick has to die first, Messalla second. Either way I don’t mind. And like I said in our most recent JabberCast, I’d appreciate if they take more time on Finnick’s death than they do on Messalla’s, as we all care much more about Finnick anyway. The scene when Peeta has a near-attack must be included. Mainly because it’s the one iteration of the “Stay with me”/”Always” they’ve been building up to since Catching Fire. It’s going to be there, no doubt about it. And it’s going to kill. Me. With feels. I hope they’ll include Katniss shooting that Capitol woman, pretty much for all the reasons Ciara outlined above, but I have to admit I don’t think they will. The trailer made it look like they’ll come up from the sewer directly into Tigris’ shop, and of course Katniss isn’t going to kill Tigris. So, sadly, I think that one will be left out. But hey, there’s still Coin, right?